It crushes multi-core benchmarks with a vengeance, but do you really need it? Monstrous. Brawny. 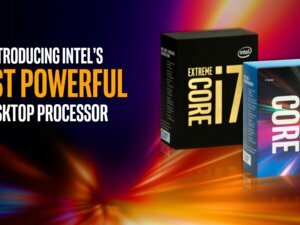 Or in the parlance of our times: OP for “overpowered.” All are apt terms for Intel’s new 10-core Core i7-6950X, a muscular CPU so over-the-top in power, that you’d have to be crazy to need one. 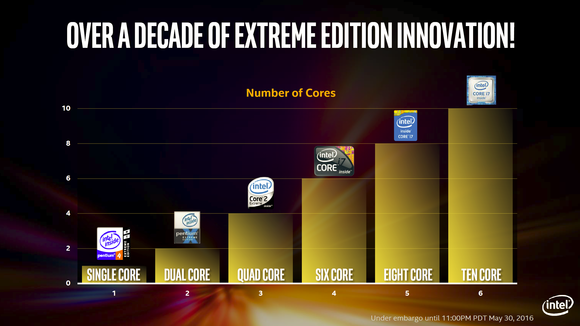 But Intel’s Extreme Edition CPUs have never been about catering to practical need. No, they cater to your desire for raw performance.This time, though, Intel is pushing both performance and your wallet to the very edge with a CPU priced at $1,723. No, that’s not a typo: $1,723. For just one CPU. For more details on the chip, read Mark Hachman's deep dive. To find out if Intel’s brutishly powerful chip is worth it, read on. Intel has been pushing the Extreme Edition chips for a decade now but this one may top them all. The Broadwell-E family includes four models all of which cost a little more than the Haswell-E chips they replace. 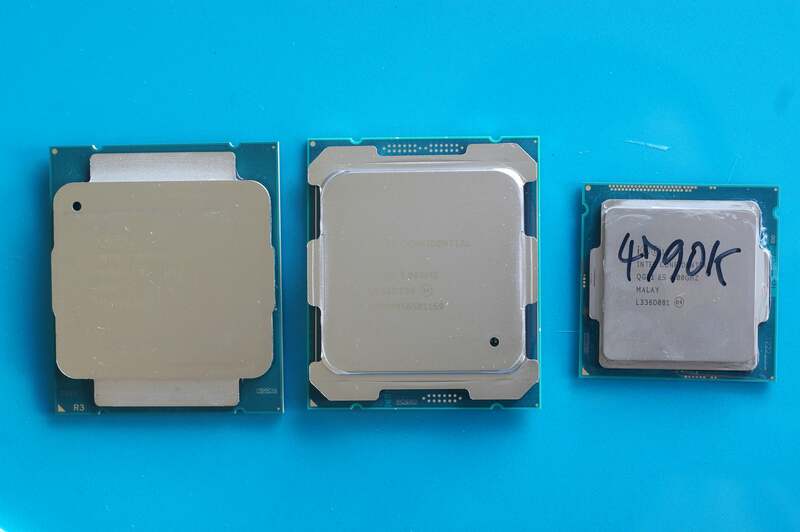 The Broadwell-E family essentially replaces the three Haswell-E family chips, which were introduced two years ago with the LGA2011-V3 platform. Except for the new 10-core Broadwell-E, which creates a new uber-chip tier above the others, the rest fall in line with the older Haswell-E chips they replace. See the details below from the original rollout of Haswell-E with the pair of smaller Haswell “K” CPUs (outside the red box). Haswell-E introduced a new LGA-2011 V3 platform and 8-cores for "free." Besides the new cores, you also get a price increase—a perk of having basically no competition. Intel continues to offer a ”budget” Broadwell-E, which has six cores and fewer PCIe lanes available in the chip. That decision isn’t technical, it’s marketing. If you want to build or buy a PC with 40 PCIe Gen 3 lanes turned on, you have to pay the extra price. On the outside, the new Broadwell-E’s heat spreader gets a more angule design that increases its strength for the more fragile 14nm chip inside. Like Haswell-E, it uses solder interface material rather than thermal paste. Broadwell-E was always intended as a drop-in replacement for Haswell-E so for the most part (more on this later) there’s no surprises. Just update your BIOS and socket in the chip and you’re ready to rocket. The new chip also supports DDR4/2400 officially, which Haswell-E did not (though it did just fine with that memory anyway). Intel’s new 10-core Broadwell-E sits in the middle, with an eight-core Haswell-E on the left and an older Haswell quad-core on the right. The actual microarchitecture inside shouldn’t surprise, either. It’s built on a 14nm process using the Broadwell (5th-gen) cores that have been in laptops since 2015 (late 2014, if you count Core M). 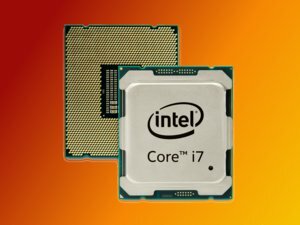 Broadwell actually made a very late appearance in desktops in the unwanted Core i7-5775C (which I reviewed) in 2015 before quickly sinking into obscurity when the 6th-gen Skylake CPUs showed up days later. Here’s a shot of the die. As you can see, it’s a native 10-core chip on the highest-end Broadwell-E part. Intel doesn’t pull any funny business by using a chip with 12 cores and turning off two. The 8-core and two 6-core models use the same 10-core chip, with cores permanently switched off. 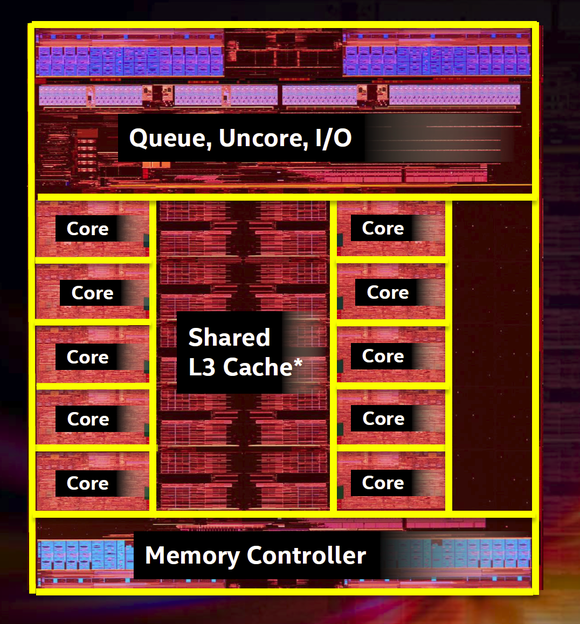 The Broadwell-E die is a native 10-core part with all of them turned on. That mystery blacked out portion isn’t Area 51. Intel says it’s Xeon functionality that isn’t used. Among the most notable changes to Broadwell-E is the new Turbo Boost Max Technology 3.0 feature. Turbo Boost was introduced with the first Core i7 chips in 2008. Like the name says, it temporarily increases the clock speed of the chip to improve performance. 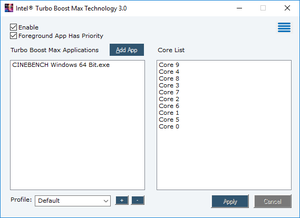 The Turbo Boost Max Technology 3.0 utility lets you set an app to run on the fastest core. Turbo Boost Max 3.0, exclusive to the Broadwell-E, is quite different. Intel said it identifies at the factory which CPU core is the “best” and runs it at a higher clock speed than the others. Turbo Boost Max 3.0 can then bind single-threaded applications to that one higher-flying core, for a performance boost of up to 15 percent. 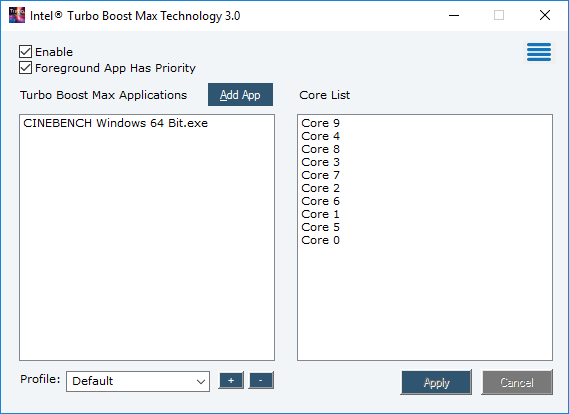 Turbo Boost Max 3.0 can boost apps in the foreground, and it lets you assign a particular app to a particular core or cores. In Windows, you’ve been able to bind a certain program or process to a particular core or thread by changing the affinity. Turbo Boost Max 3.0 does it for you automatically (once set up). 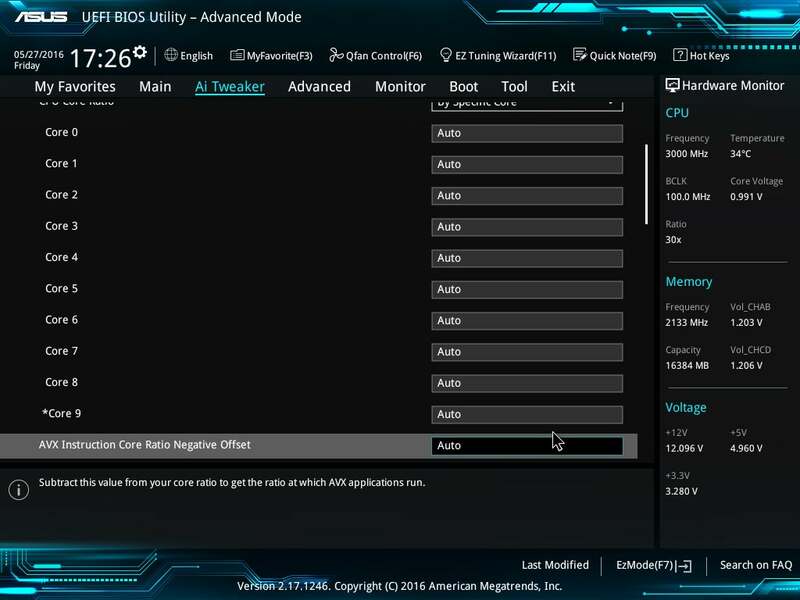 The BIOS of the Asus X99 Deluxe II board shows the list of the cores and the asterisk indicates what is the “best” core of the litter. Broadwell-E has a few features catering specifically to the overclocking sports—nerds who push CPU clock speeds to multi-gigahertz levels using liquid nitrogen and other exotic cooling methods in competition. One feature, for instance, lets you crank back the AVX ratio to lower the power it consumes during benchmark runs. Not everyone is into extreme overclocking sports, though. Many just want to tune a CPU to its highest actual usable performance. 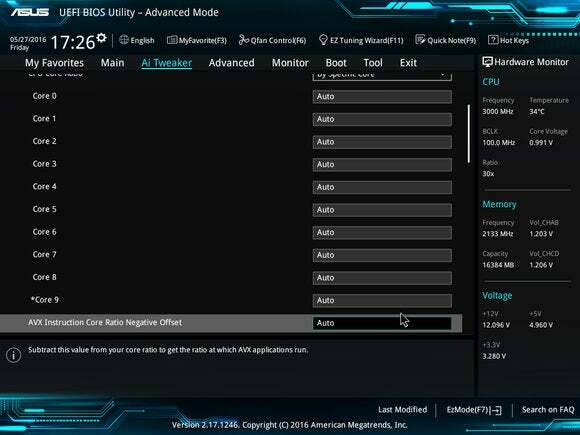 For them, Intel has added per-core overclocking. With older CPUs, overclocks were somewhat granular in that you could pick higher frequencies based on whether it was using, say, two cores. The cores picked, though, were random. With Broadwell-E you can overclock a specific core and even change its individual voltage. When combined with Turbo Boost Max 3.0, you could, say, set an application to run on that particular overclocked core. That pays real dividends in performance for someone willing to put in the tuning time. It’s no coincidence that so many of Broadwell-E’s innovations are aimed at giving the chip better performance in single-threaded or lightly-threaded tasks. That’s because Intel knows applications that can take full advantage of the resources of a 10-core chip, or even an 8-core chip, are rare. That inconvenient truth has always put the company’s big chips at a distinct disadvantage to the smaller quad-cores such as Intel’s Core i7-6700K. With fewer cores and lower thermal overhead, those quad-cores can easily run at higher clock speeds. For example, the same Core i7-6700K has a base clock speed of 4GHz, while the top-end 10-core Broadwell-E has a base clock of 3GHz. All the tweaks Intel has put into Broadwell-E, the company said, should put it on far better footing with a nimbler quad-core, while giving it the capability to blow the doors off when the load needs more than four cores.